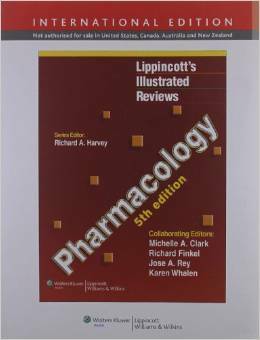 Lippincott's Illustrated Reviews: Pharmacology, Fourth Edition enables rapid review and assimilation of large amounts of complex information about the essentials of medical pharmacology. Clear, sequential pictures of mechanisms of action actually show students how drugs work, instead of just telling them. As in previous editions, the book features an outline format, over 500 full-color illustrations, cross-references to other volumes in the series, and over 125 review questions. Content has been thoroughly updated, and a new chapter covers toxicology. New to this edition will be a companion Website containing all of the illustrations, fully searchable text, and an interactive question bank.